George Telegraph edged past Armed Police Force Club, Nepal by a solitary goal. George Telegraph, Kolkata secured its berth in the quarterfinal round of the ongoing 38th All India Governor’s Gold Cup International Football Tournament being held here at Paljor Stadium. In the second pre-quarterfinal match played on Wednesday, George Telegraph edged past Armed Police Force Club, Nepal by a solitary goal. Both teams came up on the field with an attacking game and made a constant pressure on each other with attacks and counter attacks. However, both teams failed to convert any attack into the lead and the first half seemed to end goalless until Mahitesh Roy scored the lead for George Telegraph in the dying 44th minute of the first half. APFC players continued with their attacking game from the beginning of the second half but could not able to breach the defence of Kolkata team. In seven minutes injury time of the match, Nepal team even received two direct free kicks from near D-box area of the opponent but failed to capitalize the opportunities. Now, George Telegraph will take on an ISL team, ATK Kolkata (Reserve) in the quarter-final match on October 28. 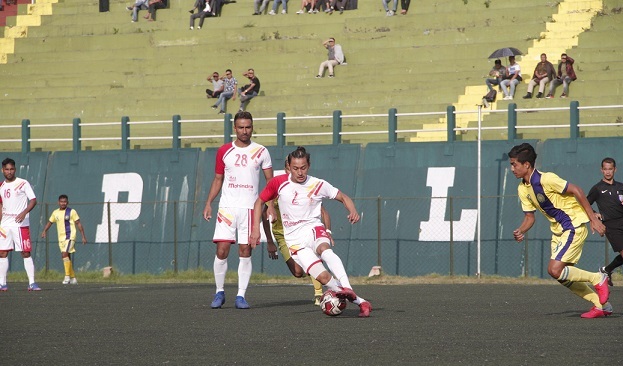 On Thursday, the third pre quarter-final match will be held between home team Sikkim Aakraman Football Club and Sogolband United, Manipur.